Hiragana is one of the two Japanese 'syllabaries', the writing systems used to represent the sounds of Japanese syllables. If you are just starting out with your Japanese studies, learning hiragana is one of the most useful first steps you can take. Hiragana symbols are used in all Japanese sentences to represent grammatical constructions such as verb endings and particles, as well as for words for which there are no kanji or only less common kanji. If you are just starting out with your Japanese studies, learning hiragana is the most useful first step. Once you have learnt hiragana, your second step should be the other syllabary, katakana. Kanshudo flashcards are free to use, but you need to be logged in. Please LOG IN (or REGISTER) now. Registration is free, fast and easy, and brings many benefits in addition to flashcards. When you are ready, take the Kanshudo hiragana CHALLENGE. The basic hiragana chart is as follows. 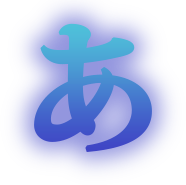 The 'dakuten' symbol ( ゛) and the 'handakuten' symbol ( ゜) are not used on their own - they are used to modify the hiragana symbols they appear after. When ゛is displayed after another hiragana symbol, it indicates that the symbol should be 'voiced'. 'Voicing' is a linguistic term for a sound that makes the vocal cords vibrate - as opposed to just emanating from the mouth. In Japanese, this means that the sound of a consonant moves further down your throat. So, for example, the unvoiced sound か (ka) becomes the voiced sound が (ga). When ゜is displayed after a hiragana symbol, it changes the sound to a 'p' sound, so for example, は (ha) becomes ぱ (pa). The basic hiragana can be modified in a couple more ways. Hiragana ending in 'i' can be followed by a small ya, yu or yo (ゃ, ゅ or ょ), which elides the sounds of the two characters. For example, き (ki) plus や (ya) would become きゃ (kya). This type of modification is known as 'yōon'. Finally, a small っ can be used between two hiragana to double the second consonant. For example, いって is read as 'itte'. This is known as a 'sokuon'. When hiragana symbols are used to inflect kanji-based words, they are known as 'okurigana'. For example, in the word 高い (たかい, high / expensive), the い is an okurigana. To learn the hiragana, there is no substitute for lots of practice! Practice your recognition with flashcards (use the link at the top of this guide), develop muscle memory by practicing drawing, and take the Kanshudo Challenge to learn and test hiragana in context. Most importantly of all, practice using hiragana by reading Japanese sentences whenever you can. Use our Hiragana Drawing Practice, or practice any individual hiragana by using one of the links below. 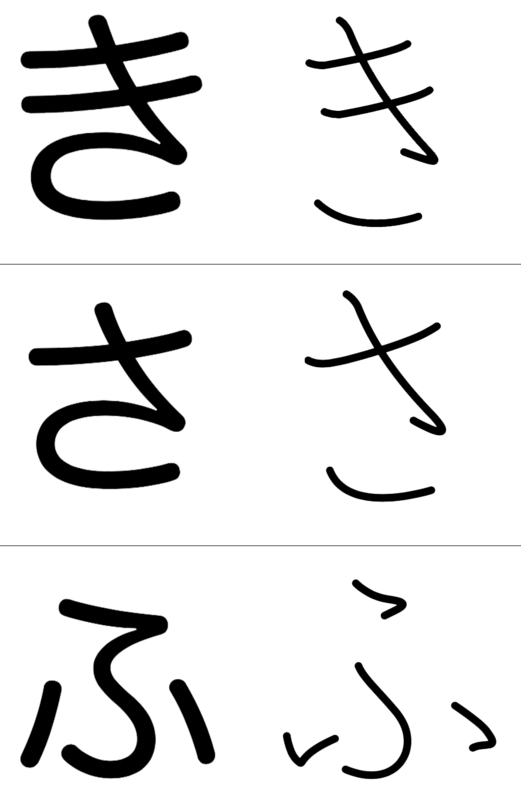 Several hiragana can appear quite different when displayed in different fonts - even to the point of having different stroke counts when compared with the common handwritten versions. Additionally, the printed versions of some characters are a little different to the standard way of drawing the characters (which is the form Kanshudo's drawing practice uses). These differences are especially common for the following characters: き, さ, そ, ふ and ゆ. For example, when き is drawn by hand, it is typically composed of four strokes, and the fourth stroke forms a curve at the underside of the character which is entirely separate from the lattice made by the first three characters. However, in most printed fonts, the third stroke joins the fourth stroke, leading to a character which appears to be made of only three strokes. None of these differences is 'incorrect', and you will need to recognize the various versions as you will encounter them in the real world. A similar issue exists with certain kanji.